This fundamentally new way of solving factual queries has brought revolution into the world of online fact finding, and many other online destinations have integrated powerful Wolfram Alfa search engine into their working environment (most notably Google Now voice search service that can be found in Android 4.1 mobile devices). With easy to use interface and innovative search engine, Wolfram Alpha’s powerful algorithms and methods can bring to you expert-level knowledge in mere seconds. You only need to wish for it. There are several services on the web that can help you to find answers to majority of your questions, some are fast, some are slow, some offer direct answers, some just point you to possible websites that hold answers. However, Googling the answer, searching the wiki, asking your friends on social media and asking question on popular Q&A websites like Yahoo Answers can often last long time, or give you bad answers. If you really want to find quick answer to some obscure question or some question that you know that some sources have trouble finding, you need to visit some dedicated knowledge databases services. One of the best ones that you can find is without a doubt Wolfram Alpha, service that has since 2009 offered access to incredible wealth of carefully curated information that spans everything form history, current events, fun trivia, and more. If you want answer to something using natural language queries and not sets of keywords, Wolfram Alpha is a service that you have to visit and use. Wolfram Alpha is a knowledge and answer engine that has over the last 4 years managed to provide users from all around the world access to incredible catalogue of answers to factual queries. Their powerful cloud engine took all the knowledge from Wolfram earlier project called Mathematica, and transformed its computational algorithms with new capabilities that can search through external-sourced “curated data” that can give you direct answers to you questions that are asked using natural language. This means that Wolfram Alpha does not work on the principle of ordinary web search engine that points you only to the relevant web pages, but it will provide you with concrete answers that were collected by authorized news sources. Running on the platform that uses more than 10 thousand CPUs, Wolfram Alpha knowledge base search is today integrated into many external services, including Microsoft’s Bing search engine, DuckDuckGo, Iris, BlackBerry 10, Dexetra, and Apple’s Siri. In addition to free service that can be accessed by anyone from any modern internet equipped device with a browser, Wolfram Alpha also offers Pro tier that is aimed to satisfy professionals and users who want advanced access to WA upload, filtering and analytics services. 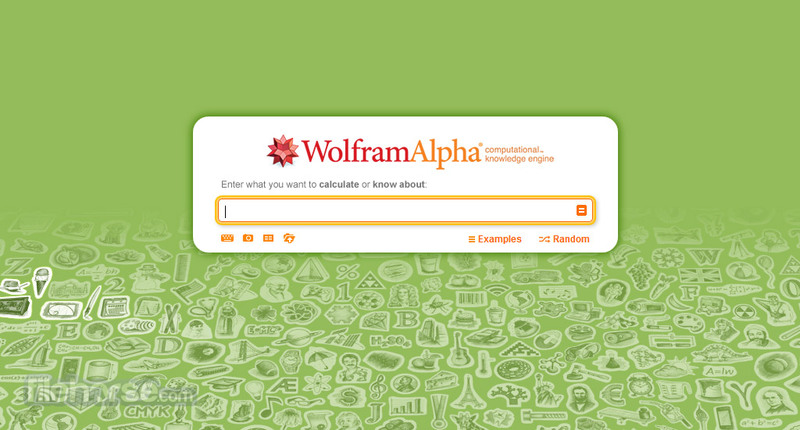 Landing page of Wolfram Alpha website is very simple, featuring large search query box and minimal configuration options. After asking your question, you will land on the search listing page that often offers not only answer to your question, but secondary data like frequency of your search query, info about people you have searched, related queries and more. If you have user account on Wolfram Alpha, your search queries and answers can be bookmarked, and you can manage you search history, uploads, downloads and account settings. 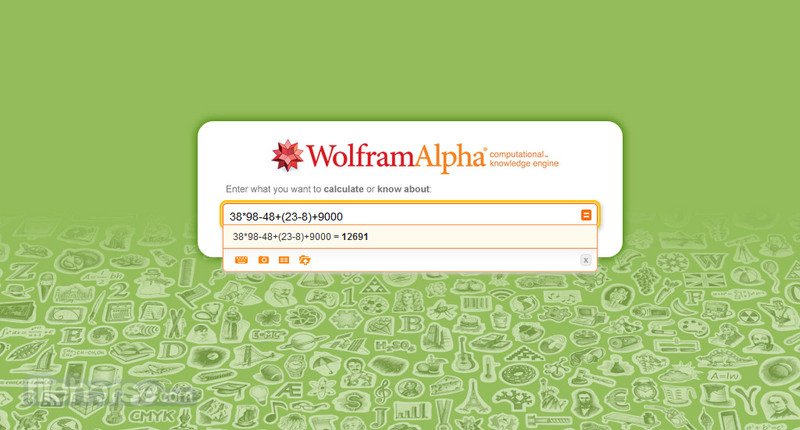 Wolfram Alpha is free for use for ordinary users. Questions and answers service can be accessed without paying anything and without obvious restrictions. Pro version of the site costs $4.99 per month (currently also $2.99 for students), which will give you more search inputs (images, music, videos),better analytics and more focused search calculation, customizations and downloads. Wolfram Alpha is one of the most innovative and useful services on the web that hosts tremendous amount of usable data that can help your productivity and curiosity. 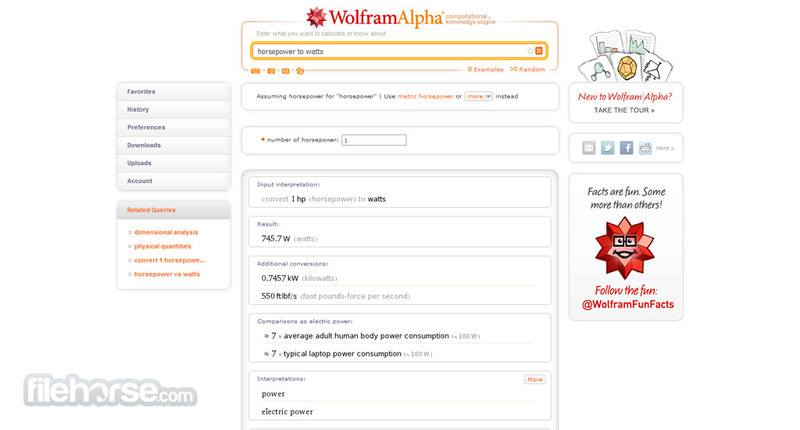 No matter where you are, powerful search engine of Wolfram Alpha can always be accessed.